A new comic has been released by the United Kingdom Without Incineration Network (UKWIN). 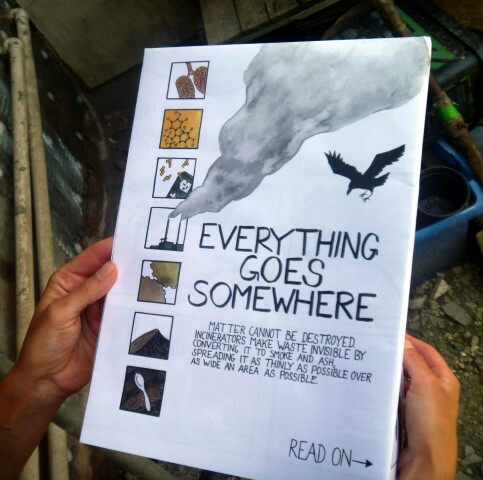 The comic, titled ‘Everything Goes Somewhere’ features intricate illustration and lettering from Frances Howe, and can be purchased at UKWIN website. The illustrated comic is a work of art in itself and can be used to communicate the message that incineration has no places in a circular economy where we need to look towards zero waste solutions. Within the first week of publication, the pamphlet has already sold more than 1,000 copies and is currently being translated into Bahasa Indonesia, making it more accessible across South-East Asia. For Frances the project took 9 months of work from the conception of the idea to the release, and made up a part of their Masters Degree in Graphic Arts. The project received research and administrative assistance from Zero Waste Europe and UKWIN leading the the publication of this amazing document. The illustrator Frances Howe elaborated on their work, saying “My work attempts to generate debate and provoke more questions than it answers. I like working with visual narratives because they provide different ways for people to experience a piece of work. For example, do they focus on the pictures or the text? Do they read it in a linear way or take it in all at once? This makes comics an inherently democratic medium because the viewer has so much choice about how to interact with it. “I wanted to make comics about extreme energy in general, and waste incineration in particular, because it brings up a lot of topics and questions that are not always easy to discuss; questions about energy, climate change, pollution, social and environmental justice, as well as consumption, capitalism, local democracy and community agency for change. The comics are printed in full colour on two sides of durable A1 card which has been folded down to A4, and can fold out to be used as a poster highlighting the necessity for a move to a zero waste world. The comics can be purchased from the UKWIN website with discounts available for buying larger quantities.